Can Fender create shockwaves in the acoustic market? The two identical channels, the great looks, studio quality FX and tone makes the Fender acoustic 200 one of the most flexible units available today. This amp sounds fabulous and looks great in the home or on stage. With no cover included a varnished finish makes it vulnerable to knocks and scrapes. Fender is probably best known for electric guitars and amplification. But over the last few years the manufacturer has introduced a range of acoustic amplifiers that compete with some of the best on the market. 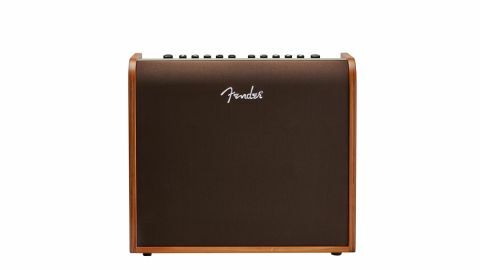 The Fender Acoustic 200 is a twin channel amplifier which, unusually for an acoustic amplifier, has two identical channels, rather than dedicated channels for guitar or microphone. This gives flexibility to use two microphones - potentially, one to mic up a classical, or a steel strung guitar not fitted with a pickup and the other for vocals - or indeed another guitar (either plugged in or mic’d up). This facility also means it could even be used with a couple of mics as a public address system, for example. Cosmetically, the Acoustic 200 is a great retro-looking piece of kit. In fact, it’s the only amplifier we haven’t been asked to hide away when guests come over! The wooden ply cabinet construction is finished with a natural blonde varnish, complemented by a brown fabric grille with the Fender logo embroidered onto the cloth. The handle is very cleverly concealed and is part of the speaker baffle. Four rubber feet fitted to the underside of the cabinet isolate it from the floor and give a stable footing. A kick-back stand is fitted to the back panel which enables you to tilt the amplifier back for better sound projection and monitoring. All in all, it’s a handsome beast. As mentioned earlier, the control layout is identical for both channels. It comprises: volume, phase switch, low, mid, high, FX level, and FX select. Although the controls are identical in function, the physical positioning is slightly different per channel. The frequencies used for voicing the tone controls are matched perfectly to the speakers and cabinet. Two eight-inch speakers with high frequency ‘whizzer cones’ (parasitic tweeters) are fitted to the wooden baffle. The amount of low end this amp produces is amazing. In fact, the overall tonality is very well-balanced with sweet mids and highs, which compliment the prominent bottom end. The phase switch helps to reduce any resonant feedback from your guitar, which means you can play at fairly high volume levels while sitting close to the amp. In our opinion, this is better than the fiddly parametric controls that some manufacturers employ to control feedback, especially on lower powered acoustic amplification. It may seem counter intuitive, but the more power an amplifier has at its disposal, the higher the volume levels can be set before the onset of unwanted feedback. The built-in effects section has fixed presets that will please the majority of players, without the need for more comprehensive editing features. You’ve got two types of reverb - room and hall - plus two multi-effect combinations of delay and chorus, as well as delay and hall reverb. Other effects include tape echo, digital delay with repeats, chorus, and finally, a great vibratone effect. You can dial in the amount of the selected effect with the FX level controls, which are available separately on both channels. The other features on the front panel are: two combination jack/XLR inputs for guitar or mic (one per channel), one 3.5mm auxiliary input socket and one 3.5mm headphone socket. On the back panel you will find the IEC mains socket and the power switch. There are also two balanced XLR output sockets to allow you to connect the amplifier to a PA system. Another useful feature is the USB socket, meaning you can connect the amplifier to a laptop or PC and use it as a soundcard for recording your performance. To enable you to control the effects, there is a foot switch socket adjacent to the USB socket. The foot switch is available as an accessory, part number, 0080996000. The amplifier is also equipped with Bluetooth to enable audio streaming for backing tracks. We tried out the Fender Acoustic 200 with several different makes and models of acoustic guitar to get a feel of how it sounds. The guitars used were a Gibson hummingbird with an under saddle pickup and active preamp, a Hagstrom parlour guitar with an undersaddle pickup, also fitted with a preamp and active tone controls, and a Breedlove American series acoustic guitar with an under saddle pickup and active preamp. We also tested it with a Gibson solid body ‘acoustic’ Chet Atkins SST. The Acoustic 200 has very ‘Hi-Fi’ tonal characteristics, as opposed to the harder midrange tonalities associated with many PA systems. This helped to reveal the inherent differences between the various guitars used here. The Gibson hummingbird had distinctive highs and lows giving it a more strident tone than the natural acoustic sound, but nevertheless recognisable. The Breedlove had a lovely balanced tone, sounding very similar to the unplugged tone of the instrument. The little Hagstrom parlour guitar sounded the sweetest as the more defined upper mid tones chimed bell-like through the amp, but with extra depth in the bass compared to its natural unplugged sound. The Gibson Chet Atkins, being a solid body, made a good simulation of an acoustic sound but had little of the natural body resonances that makes for a great tone. However you could play it LOUD without feedback issues. We tried several mics, ranging from the trusty Shure SM58, to the CAD C95 condenser mic. All sounded really good, with the condenser mic having the edge over clarity. In every situation we tested it against, the Fender Acoustic 200 amplifier sounds great and works brilliantly with different guitars and microphones.